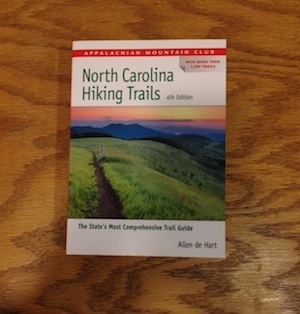 The Appalachian Mountain Club's "North Carolina Hiking Trails" is the state's most comprehensive trail guide covering more than 1,300 trails covering 3,500 miles of NC's hiker's paradise. Short family treks to long-distance trails in the mountains. You'll find coverage of the Blue Ridge Parkway, and in Pisgah National Forest and Great Smoky Mountains National Park, plus trails in national forests, county parks, and much more. Each trail description details distance, difficulty, elevation, connecting trails, landmarks and more.